It is no surprise that red wine has risen in popularity over the past few years with all of the media coverage regarding its supposed health benefits, and the increased availability of more reasonably priced wines among a few of the reasons. Red wine is everywhere, and wherever it is being served you know that undoubtedly stains will follow. The following ways to remove red wine stains really work best if you get to it right away while it is still wet. Time is definitely of the essence in this situation - once it has dried, you may have trouble removing it completely. Clothing - Blot immediately with white paper towel - once again, do not let the stain dry! - keep re-wetting the stain with cold water or club soda if necessary, until you are ready to treat. If the stain is small, dabbing an ice cube will sometimes help to dilute the stain and remove a good bit of it at the same time. As soon as possible, soak the garment in a solution of the hottest water allowable according to the care label and oxygen based stain remover (like Oxiclean). Another trick that has worked on white synthetics like rayon, is soaking the stained portion in milk, however that can take an hour or more until it is gone completely. Red Wine on Tablecloths - Pour a mound of salt or baking soda onto the wine to absorb as much as possible. After dinner, put the tablecloth into cold water and soak it for about 20 minutes. Then pour liquid enzyme detergent directly onto the area and soak it in the hottest water that's safe for the fabric for about 30 minutes. Launder as usual. Air dry. Wine on Sofa - Pour club soda on stain then blot with white paper towels.Then take a little woolite laundry detergent and work it into the remaining stain, 'rinse' with cold water again and continue blotting dry. Carpet - My first choice is Resolve Professional Spot and Stain Ready-to-use Carpet Cleaner Trigger, 32 Ounce If you have none, then try this: First, soak up as much as possible with a white towel, then mix 1 tablespoon of plain or lemon scented ammonia in 1 cup of warm water. Saturate the stain and then absorb most of the liquid with a towel. Follow up by putting white vinegar on the stain, let it set for a couple of minutes. Absorb again with towel. Yet another method: If the stain still wet, pour salt over the stain and let it absorb the wine (if you can wait overnight) and vacuum. 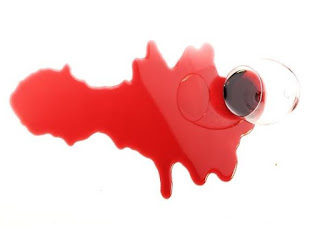 Having been a red wine drinker for many years and having to deal with those stains on a number of surfaces, I can honestly say that if you handle the stain immediately, there are really no extraordinary measures necessary. If it is something that can be rinsed and thrown in the wash, then do it right away! In these situations, my success rate has been 100%. If you can't tend to it immediately, then try to keep it wet until you reach your laundry supplies. If you keep a bottle of wine away or resolve around, it usually works for most items from clothing to carpet. Using white wine on red wine stains? While this sounds sacrilegious, some say that if that's all you have handy it will work in a pinch. Personally, I wouldn't waste the money trying. The only hard to save items are "Dry-Clean Only" - blot up as much as you can right away and get to the dry cleaner. If you are willing to take a chance (possibly ruining the garment) blot up as much as possible, dab some Dawn dishwashing detergent or Woolite on the stain, and run some cold water through it, blotting dry right away. I've done it, but do not recommend it if you really love the garment. One on-the-go product I have used with success is a travel sized spray bottle of Wine Away Red Wine Stain Remover. It is made from fruit & vegetable extracts.